Diwali festival is probably the most significant festival in India. Over the past few years, it is celebrated all over the world. But why is Diwali celebrated? What is the history of Diwali festival? The most well-known reason for Diwali celebration is the return of Lord Rama to Ayodhya after 14 years of exile. But this is not the only reason. We will take a look at all the reasons for celebrating Diwali festival in the subsequent sections. Let’s take a deep dive into the details of the festival of Deepawali. We will also see the details of Diwali Puja in the upcoming sections. Diwali means “series of light”. That’s why it is also known as the “Festival of Lights”. In Sanskrit, Diwali is called as “Deepawali”. It is a four-day affair in India usually starting from Dhanteras and ending at Govardhan Puja. Diwali is celebrated during the new moon (darkest night) at the end of the Hindu lunar month of Ashvin and the start of the month of Kartika (October/November) as per the Hindu calendar. Apart from India, there is an official holiday on Diwali in countries like Fiji, Guyana, Malaysia, Mauritius, Nepal, Singapore, Sri Lanka, Suriname, Trinidad and Tobago and recently Sindh Province in Pakistan. During 14 years of exile, Ravana in the form of a sage abducted Sita Mata (wife of Rama) using trickery. Lord Ram, on hearing this, launches a war against the army of Ravana and reaches Lanka to fight Ravana and bring his wife back. The victory of Lord Rama in the epic battle of Ramayana symbolizes the victory of good over evil. It is believed that when people of Ayodhya heard that Lord Rama is coming back to Ayodhya after 14 years of exile, they decorate the entire city with oil lamps (diyas), flowers and rangolis. This is why Diwali is also known as the festival of lights. 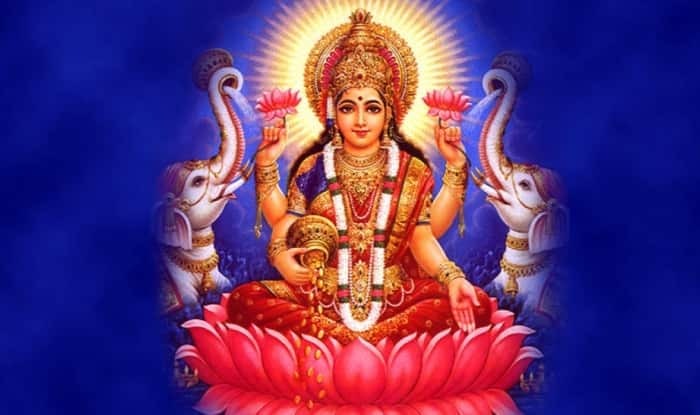 Diwali celebration is also linked with the worship of Goddess Lakshmi who is the goddess of wealth and prosperity and is the wife of Lord Vishnu. The 5-day festival of Diwali begins on the day Goddess Lakshmi was born from the churning of cosmic ocean (Kshir Sagar) of milk by the Devas (gods) and the Asuras (demons). During the night of Diwali is the day Lakshmi chose Vishnu as her husband and they were married. Along with Lakshmi, devotees make offerings to Lord Ganesha, Goddess Saraswati and God Kubera. People worship Lord Ganesha for noble beginnings and removal of obstructions. Saraswati is the goddess of music, literature and learning. Worshipping Kubera symbolizes book-keeping, treasury and wealth management. Some people believe that Diwali is the day when Lord Vishnu came back to Lakshmi and their adobe in the Vaikuntha. 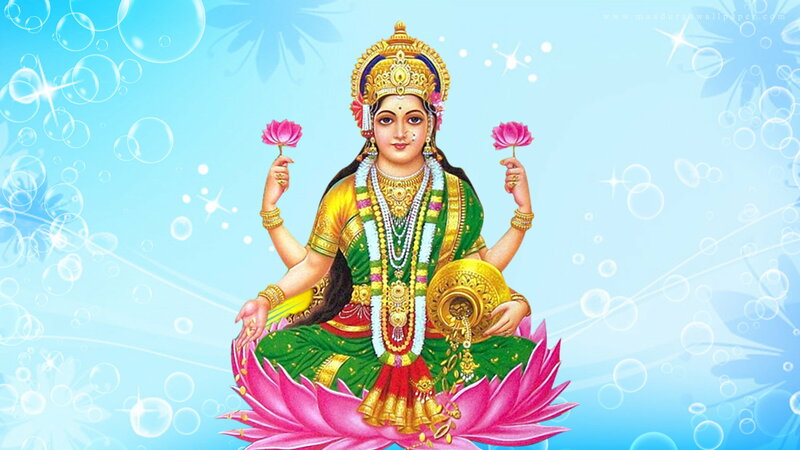 That is why those who Lakshmi during Diwali receive the benefit of her good mood. They illuminate the entire city of Hastinapur with bright earthen lamps. This tradition of lighting lamps in the memory of the return of the Pandavas is believed to be kept alive by celebrating the festival of Diwali. It is also believed that on this very day (Diwali day), Lord Vishnu in his fifth incarnation as Vamana-avatar defeated King Bali and pushed him into the nether world. Although a demon, Bali was a generous king. Thus pleased with his kindness, Lord Vishnu grants him a boon that he could return to earth for 1 day in a year to dispel darkness by lighting millions of lamps along with the people. This day of the annual return of King Bali to earth is celebrated as Bali Padyami. This is one of the reasons for celebrating Diwali. According to a legend, Narakasura was the son of Bhudevi (Mother Earth) and the Varaha incarnation of Lord Vishnu. It was prophesied that he will be killed by later incarnation of Lord Vishnu. Thus his mother Bhudevi asks for a boon from Vishnu that his son should live long and become all powerful. Vishnu fulfils all her wishes. Narakasura defeats all the kings on earth and brings all the kingdoms under his control. He was so powerful that even the King of Devas, Indra was not able to withstand his might and was forced to flee away from the heaven (Swarga). Thus Narakasura becomes the lord of heaven and earth. He stole the earring of Aditi (mother of the gods) and abducted 16000 women. Devas went to Lord Vishnu for help. He assured them he in his “Krishna” avatar will destroy Narakasura. Later Vishnu incarnated as Krishna. Then Aditi approached Krishna’s wife Satyabhama (incarnation of Bhudevi) for help. Krishna along with Satyabhama defeated Narakasura. Before his death, Narakasura asked for a boon from his mother Satyabhama that the day he died will be celebrated with colourful lights. Thus the day before Diwali i.e. Choti Diwali is celebrated as Naraka Chaturdashi. MUST READ: How Krishna died in Mahabharata? In regions like West Bengal and Odisha, devotees worship Goddess Kali instead of Goddess Lakshmi. It is known as Kali Puja. According to legend, long ago after the gods lost in a battle with the demons, Goddess Kali was born as Kal Bhoi Nashini from the forehead of Goddess Durga. Said to be a personification of Nari Shakti (female power), Kali was born to save heaven and earth from the growing cruelty of the demons. After killing all the devils, Kali lost her control and started killing anyone who came her way which stopped only when Lord Shiva intervened. The well-known picture of Ma Kali, with her tongue hanging out, actually depicts the moment when she steps on the Lord and repents. That momentous day has been commemorated ever since and the main purpose of celebrating Kali Puja is to seek the help of the goddess in destroying evil both external and internal to us as also to get her blessings for general happiness, health, wealth, and peace. King Vikramaditya was known for his generosity, bravery and wisdom. He was the legendary emperor of ancient India who is credited for the “Vikram Samvat”, the Hindu calendar. It is believed that when he was coronated as the king, citizens of his kingdom celebrate this event by lighting small earthen lamps. Many people and a few historians believe that this is the reason for the annual celebration of the festival of Diwali. In Jainism, Diwali is celebrated for a different reason. On the day of Diwali, 24th and last Tirthankaras of the Jains of present cosmic age, Vardhamana Mahavira attains Nirvana or Moksha (enlightenment). This event occurred on 15th October 527 BCE. It was on a Diwali day that the third Sikh Guru Amar Das systematized the celebration of lights as an event when all Sikhs would assemble to get the Gurus blessings. In 1619 on this day, Guru Hargobind (6th Sikh Guru) was released by Mughal Emperor Jahangir from Gwalior Fort. Also on the day of Diwali, the foundation stone of the “Sri Harmandir Sahib”, also known as Golden Temple was laid in 1577. Festival of Diwali signifies the victory of light over darkness, good over evil and knowledge over ignorance. It is a symbol of hope over despair. The night of new moon indicates despair because it is the darkest night. Despite this darkness, we illuminate our homes and subsequently our lives by lighting candles and diyas. It symbolises the victory of inner light (Rama) over spiritual darkness (Ravana). Ravana was the greatest devotee of Lord Shiva and also a great scholar. But when his ego overshadowed his intellect, he was defeated by Rama. Dhanteras is celebrated on the first day of Diwali. It is also known as Dhanwantari Trayodashi. During this day, people usually buy utensils, silverware or gold. It is believed that if you buy some form of precious metal on Dhanteras, it will bring you good luck and prosperity. Dhanvantari ( God of Ayurveda) is also worshipped on Dhanteras. From 2016 onwards, this day is also declared as the “National Ayurveda Day” by the Government of India. There is an ancient legend associated with Dhanteras [Source]. Once there was a King named Hima. He has a son who was newly married. His horoscope prophesied his death on his 16th birthday due to a snake-bite. In order to protect her husband, his wife kept him awake all night on his birthday. She accumulated all her ornaments in a heap and placed them at their doorstep. Inside, she lit the room with lamps to eliminate darkness from every nook and corner. She thought that her husband may die if he falls asleep. So to keep him awake, she started singing songs and reciting poems. When Yama Raja, the god of death arrived, disguised as a snake, to take the life of his husband, his eyes get dazzled by the bright light of lamps inside the room. Because of this, he was unable to enter the room. Thus he failed in his attempt to enter the room and sat on the top of the heap of ornaments and listen to songs recited by the prince’s wife all night. In this way, the prince was saved. Thus many people keep the lamps burning throughout the night of Dhanteras. On the second day, Choti Diwali is celebrated. It involves preparations for the Badi Diwali. People start decorating their houses with lights and hold get-togethers. As I told you earlier that according to Bhagavata Purana, the asura (demon) named Narakasura was killed by Krishna, Satyabhama and Kali on this day. That’s why Choti Diwali is also known as Naraka Chaturdashi. On the fourth day, Badi Diwali is celebrated. People wear new clothes or their best outfits during this day. They lit the diyas or the candles and perform Lakshmi Puja and also worship Ganesha, Saraswati and Kubera. Lakshmi is believed to roam on earth on Diwali night. On the evening of Diwali, people open their doors and windows to welcome Lakshmi and place diyas on their windowsills and balcony ledges to invite her in. After Diwali Puja get over, people on the streets burst crackers. The fireworks signify the celebration of Diwali as well a way to chase away evil spirits. The day after Diwali is celebrated as Govardhan Puja in honour of Lord Krishna. 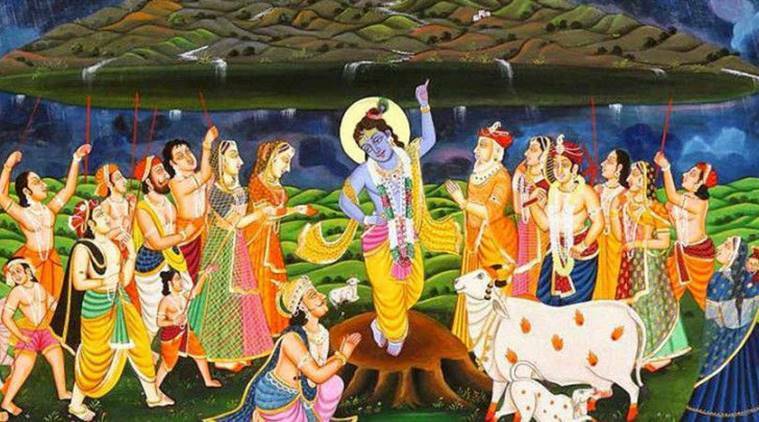 According to Bhagavata Purana, on this day when Krishna lifted Govardhan Hill to provide the villagers of Vrindavan shelter from torrential rains. The incident is seen to represent how God will protect all devotees who take singular refuge in him. It celebrates the sister-brother loving relationship. It is similar to Raksha Bandhan but with different rituals. The day ritually emphasizes the love and lifelong bond between siblings. On this day, sisters apply tilak on their brother’s forehead and siblings pray for each other’s well-being. 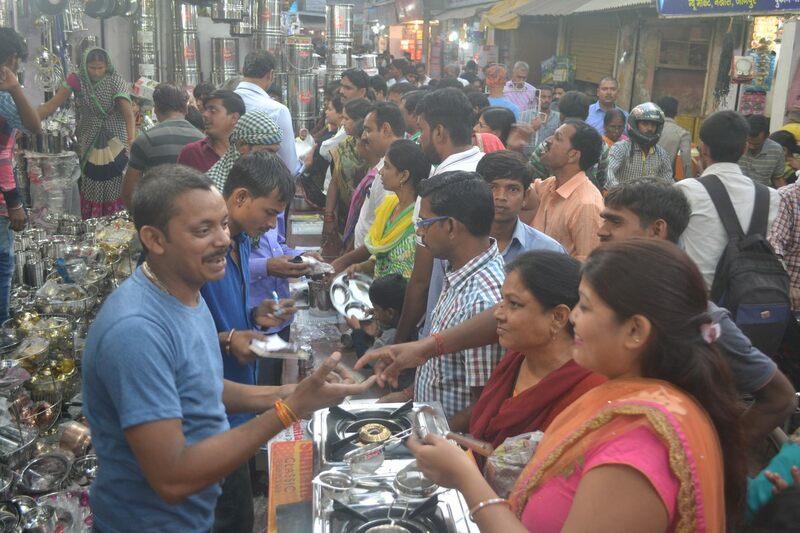 People light up diyas inside and outside their houses, participate in family puja typically to Lakshmi (goddess of fertility and prosperity). After the puja, people burst firecrackers. By the Diwali for kids is all about burning crackers all night. Relatives distribute sweets with each other. There is an exchange of gifts between family members and close friends. Diwali is one of the biggest shopping seasons in India and Nepal. People buy new clothes for themselves and their families, as well as gifts, appliances, kitchen utensils, even expensive items such as cars and gold jewellery. Kaju Katli, Besan Laddoo and Soan Papdi are some of the most common sweets enjoyed during Diwali.